On August 8th, 1988 at [8:08] AM, Dr. H8 set a plan in motion to bring the world to its knees! pay him a sum of 88 octillion dollars in 88 minutes or 88 thermonuclear warheads will destroy the Earth! In a situation like this, the world needs its best heroes. . . Unfortunately, they were busy. Instead, the world sent 88 of their not quite the best heroes to stop Dr. H8. And when even they weren't enough, the Nintendo Switch brings you 88 Heroes – 98 Heroes Edition! it seems the efforts of Arach-Nerd were not enough. Ascii the Magic unicorn just was not cutting it in the hero biz. No, we need more! How many more? Eight mo-no, I mean TEN MORE! 88 heroes – 98 Heroes Edition has all of the action of the original game plus the RSG Champions DLC. Wait… that only brings the hero count to 96. THAT'S RIGHT! The game also includes the upcoming H8 Mode Activate DLC. This adds two more heroes in eight of the toughest challenges yet! 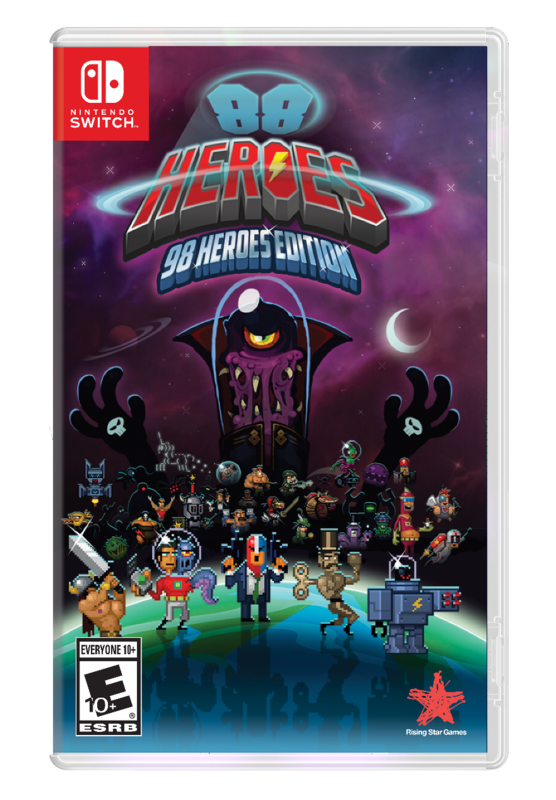 88 Heroes – 98 heroes Edition is exclusive to Nintendo Switch, but the content will still be available to both PS4 and Steam players. The game is expected to launch in North America on October 2 and October 10 elsewhere.